-- Select a Size/Color -- 5/8" x 4' Length 5/8" x 6' Length - Out of Stock! 1" x 6' Length - Out of Stock! Searching for a classic nylon dog leash in a cheery color? 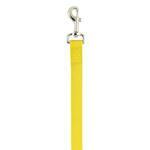 Look no further than our Zack & Zoey Nylon Dog Leash in Yellow! 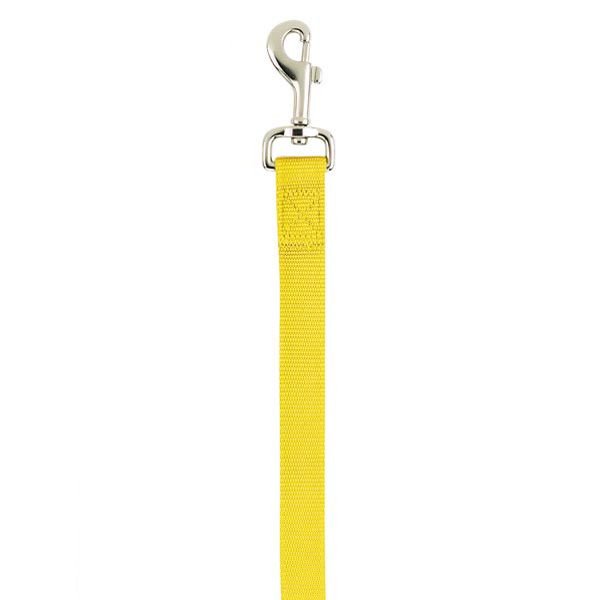 Add some durability and classic style to your walks with our Zack & Zoey Yellow Nylon Leash. 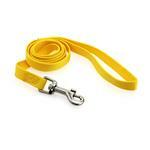 This cheery yellow nylon leash will be a staple for any dog or cat's walking wardrobe. Each leash features a nickel-plated swivel clip for a quick and secure attachment. The bright yellow color will go with anything and is a great choice for spring and summer events. This leash is perfect for supporting your favorite sports teams that feature yellow such as the Minnesota Vikings and the San Diego Chargers. Or for basketball fans the yellow leash is great for teams like the Denver Nuggets, the Golden State Warriors, and the Los Angeles Lakers. Pitsburg Pirates fans will also love this yellow dog leash. You will love the classic design of this nylon dog leash in Yellow, but this style is also available in other colors too. Matching couplers, collars, and dog harnesses are available as well. Posted On 07/16/18 by Tatiana M from Galveston, TX Yes, Tatiana M recommends this product! Posted On 06/05/18 by J.A. G from Chicago, IL Yes, J.A. G recommends this product! Posted On 07/30/17 by Joie T from Toms River , NJ Yes, Joie T recommends this product! Posted On 04/25/17 by Tatiana M from Galveston, TX Yes, Tatiana M recommends this product! These leashes are terrific. The colors are bright and wash well. Have them in all your colors! The leash is of very good quality and washes well too. My dog has one in every color. I love this yellow leash. Posted On 08/01/16 by Tom S from , WA Yes, Tom S recommends this product! Well made and at a good price. It was hard to find this combo in yellow so I was glad you had it. Posted On 07/17/16 by Denise N from , NY Yes, Denise N recommends this product! Wonderful quality leash. Vibrant color, looking for a matching harness next!! Great size for our little one... and matches her new collar color! Posted On 01/02/16 by mel m from , MI Yes, mel m recommends this product! As always great quality heavy duty latch and bright vibrant colors. Zack and zoey products are great. Happy that I can get a bright yellow leash to match the collar. Great quality. Vibrant colors. Posted On 12/14/15 by sue k from Burley, ID Yes, sue k recommends this product! Posted On 11/14/15 by marsha b from lafayette, IN Yes, marsha b recommends this product! love the yellow leash just right would definetly recommend it. Posted On 04/18/15 by Heather A P from Helotes, TX Yes, Heather A P recommends this product! I have been looking for a small (in diameter) leash for our little 9 lb. Miniature Dachshund to match her yellow collar and harness. Yellow is a difficult color to find in pet products, so I was delighted when this came available. You can't beat the price and quality for it either! Posted On 01/30/15 by christine o from Chesterfield, MO Yes, christine o recommends this product! We absolutely LOVE BaxterBoo!!! And Zack & Zoey! !